Sir Henry Norman, 1st Baronet PC (19 September 1858 – 4 June 1939) was an English journalist and Liberal politician. Norman was educated privately in France and at Harvard University, where he obtained his B.A. For several years he worked on the editorial staff of the Pall Mall Gazette and later joined the editorial staff of the News Chronicle, being appointed Assistant Editor of the latter in 1895. He retired from journalism in 1899. During this time he travelled widely in Canada and the United States and in Russia, Japan, China, Siam, Malaya and Central Asia. Much of the material included in the two volumes mentioned in the description was amassed during these tours. He was appointed Assistant Postmaster-General in 1910 and his interest in international communications led to a number of appointments related to wireless and telegraphy, among them Chairman of the War Office Committee on Wireless Telegraphy 1912, and Chairman of the Imperial Wireless Telegraphy Committee of 1920, the latter convened to draw up a complete wireless scheme for the Empire. He was Liberal M.P. for Wolverhampton South 1900-1910 and for Blackburn 1910-1923. Norman was born at Leicester, the son of Henry Norman, a merchant and local radical politician. Norman was educated at Leicester Collegiate School and Grove House School and later studied theology and philosophy at Leipzig and Harvard University. His family were Unitarians in religion and Norman first embarked in a career as a preacher but he gave up this calling and his religion on his return to England. In 1891 he married Ménie Muriel Dowie (1867-1945) but they divorced in 1903. 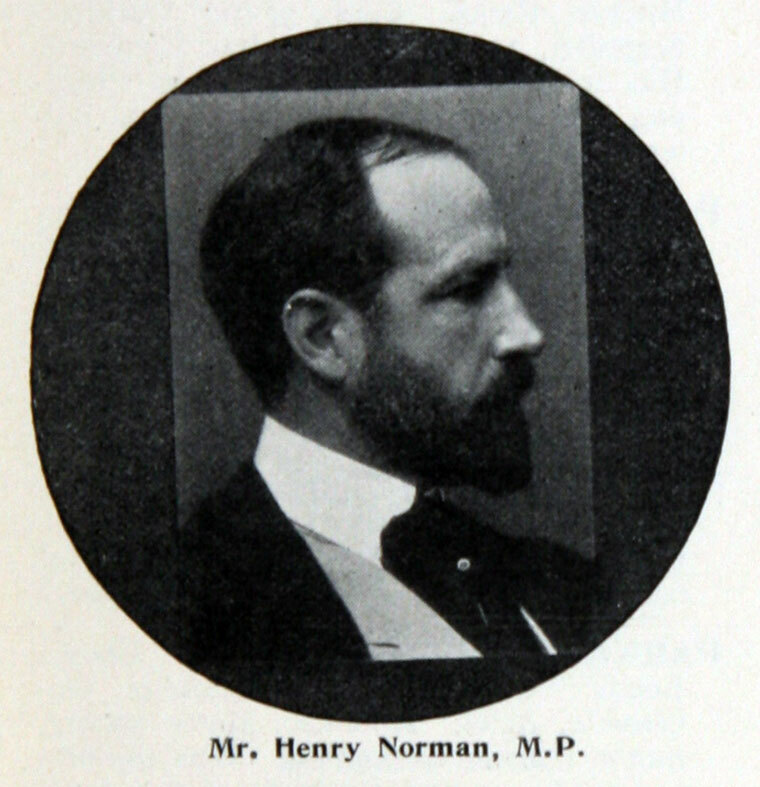 Norman was awarded custody of their son Henry Nigel St Valery Norman who was born in 1897. In 1907 he married Florence Priscilla (‘Fay’) McLaren (1884–1964), the daughter of the wealthy industrialist and Liberal MP, Sir Charles Benjamin Bright McLaren, later Lord Aberconway. They had three children. Norman became a journalist working for the Pall Mall Gazette and the New York Times. As a journalist he was famous for getting at the truth behind the Dreyfuss Affair. He was on the staff of the Daily Chronicle from 1892, becoming assistant editor. Norman also travelled extensively in the East, where he took a number of photographs that are held at Cambridge University. Later he founded the magazine The World's Work. In other business, Norman was a director of a number of companies connected to the coal mining and iron trades industries. 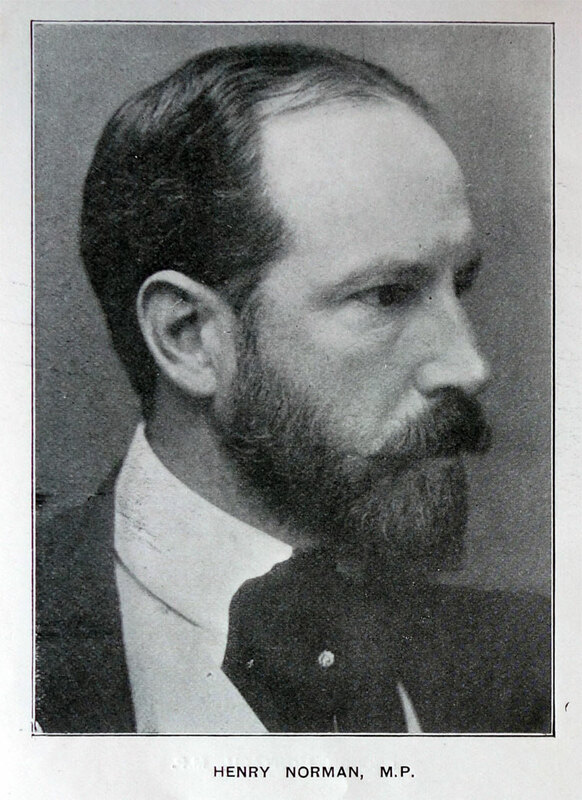 Norman was Member of Parliament for Wolverhampton South from 1900 to 1910, and for Blackburn from 1910 to 1923. He was created a Baronet, of Honeyhanger in the Parish of Shottermill in the County of Surrey, in 1915 and in 1918 he was admitted to the Privy Council. In January 1910 he was appointed Assistant Postmaster General but a few days later he lost his seat in the general election of January 1910 and he never held ministerial office again. He was however made chairman of a number of important government committees on issues ranging from Patent Medicines to Wireless Telegraphy, Rent Restrictions, Betting Duty and Industrial Paints. Norman was also appointed a Justice of the Peace for Surrey. Apart from his journalistic and political careers he was also a pioneer in wireless telegraphy. NORMAN, HENRY, M.P.- Born in 1858, and educated at Leipzig, France, and Harvard University, Mr. Henry Norman is a B.A. of the American University named, and the representative for the South Division of Wolverhampton in the House of Commons. An author by profession, he is a great traveller, his books on Japan, Russia, and the Far East being amongst his principal and most recent works. Besides these, he is the founder and editor of the monthly illustrated magazine appearing under the title of The World's Work, in which he proposes to deal regularly with motor matters. Beginning his motoring experiences with an 8 h.p. Panhard, Mr. Norman now owns an 11 h.p. Clement car, having almost given up the horse for automobilism. As an enthusiastic amateur mechanic, he has his own workshop, making his repairs mostly himself, save for the assistance of his little son, who is a very promising young devotee of the horseless vehicle. Mr. Norman is a member of the Council of the British Empire League, of the Council of the Society of Authors, and amongst other positions, he is also Vice-president of the Wolverhampton Automobile Club. He has several times defended the interests of motorists in Parliament. This page was last edited on 2 June 2016, at 17:07.